I have fallen in love with Ellen Hutsons Mondo Poinsettia set. I took a piece of Cannon cold press water color paper and cut it into quarters the taped it down to my work surface leaving a 4x5.25 work area. I then chose antique linen, evergreen bough, pine needles, peeled paint, and forest moss from the Tim Holtz distress inks to stamp and watercolor my images. 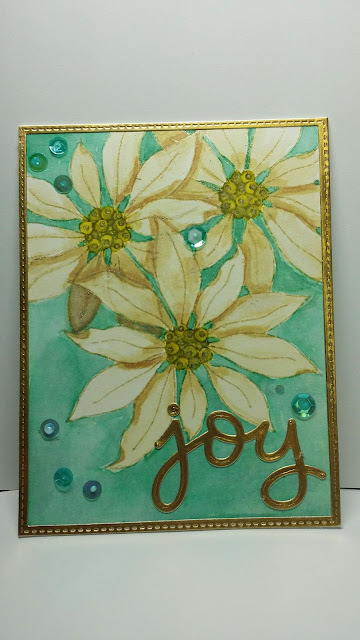 I used peeled paint first and dabbed it in the center of the flower then carefully added antique linen to the petals and stamped it on the watercolor paper. I did the same thing twice more but wiped away the ink that would overlap my previous image from the stamp before stamping it. Since the stamps are clear you just hold it above where you want it and wipe off a little at a time till you see it won't overlap what you already have. The next step is using the same colors to watercolor your images. 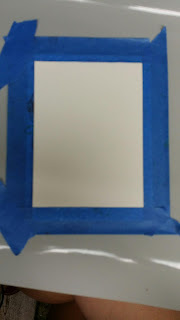 I pressed my stamp pad on an acrylic block and add a couple drops of water from my aqua brush. Picking up some of the color I painted where I wanted my shading first then went back an spread the color to the rest of the petals so they would be lighter.i did add just a tad of forest moss to the peeled paint to get my shading color. It's important to let areas that touch dry before painting next to them. After my flowers dried I painted the background using evergreen bough and a little pine needles. I cut my gold frame using blueprints 25 then blueprints 13 frame dies out of MFT gold shine card stock. Joy was cut from the same paper using Lawn Fawns Scripty Joy. Last but not least I added Little Things from Lucy's cards Caribbean Dream sequins.